Easily spotted because of the funky blue lizard on the label, Blue Lizard sunscreen products are manufactured and sold globally. It has grown from its inception to combat what they believe to be one of the most intense UV environments in the world in Australia. Tested according to Australian Standards, Blue Lizard sunscreen acquired extreme water resistance after 240 minutes in whirlpool water. Today Blue Lizard is a division of Crown Laboratories, a pharmaceutical company located in the United States. In comparison, the USA's FDA (Food and drug Administration) requires testing for 80 minutes in still water only. 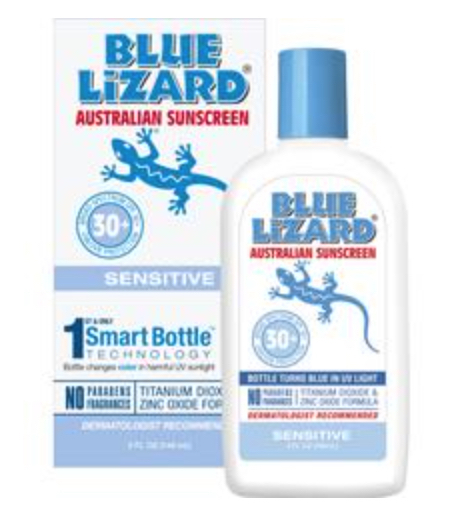 Blue Lizard sunscreen uses micronized zinc oxide as one of their core active sunscreen ingredients, which is an ingredient that has been shown to be much safer to humans on the skin than other chemical sunscreen ingredients, of which there are many. It provides excellent protection against both UVA and UVB rays, but they feel the need to use this with a combination of chemical sunscreens. It also appears their Kids sunscreen is exactly the same as the normal sunscreen - as the ingredients are not displayed as any different way? As a personal preference where kids are concerned, I like sunscreens that are a pure zinc oxide sunscreen without the potential for any chemical toxicity. Although their sensitive sunscreen contains only zinc oxide and titanium dioxide as the active sunscreen ingredients, there are a number of ingredients that I would really not like to use, never mind if I had a sensitive skin! Also known as Octyl Methoxycinnamate and known to have estrogenic or gender-bending effects. I recommend avoiding this one! Produces free radicals when exposed to sunlight, damaging the DNA and possibly causing cancer. Another one to be avoided? The best sunscreen ingredient available in my opinion, it is a mineral sunscreen that provides high protection from both UVA and UVB rays and has excellent healing qualities. All the above 3 are chemical. A very similar sunscreen formula to the SPF30 ones, with the exact same active ingredients in the same proportions, but with a few different non-active ingredients. They also have high water resistance, where they claim to retain the SPF after 240 minutes (4 hours) activity in water. What I find a little misleading, if not amusing, is that the same label that claims extremely high water resistance also instructs us to "keep out of eyes" and if not, then to "rinse with water to remove". This type of product attracts those with sensitive skin types, young skins or problematic skins, such as those with acne or eczema. Using slightly more Zinc Oxide at 8%, they unfortunately use 5.5% Octinoxate, which of course, I would far rather wasn't included at all, as well as the PEG and Parabens. I would rather choose the Sensitive Skin one for my face. So then we get to the Baby sunscreen and this is where I really want to see none of the potentially harmful chemicals used at all. However, although this is claimed to be "chemical free" by using a combination of Zinc Oxide 10% and Titanium Dioxide 5%, it does contain the same chemicals noted above that I wouldn't want adults to use, never mind children or babies! 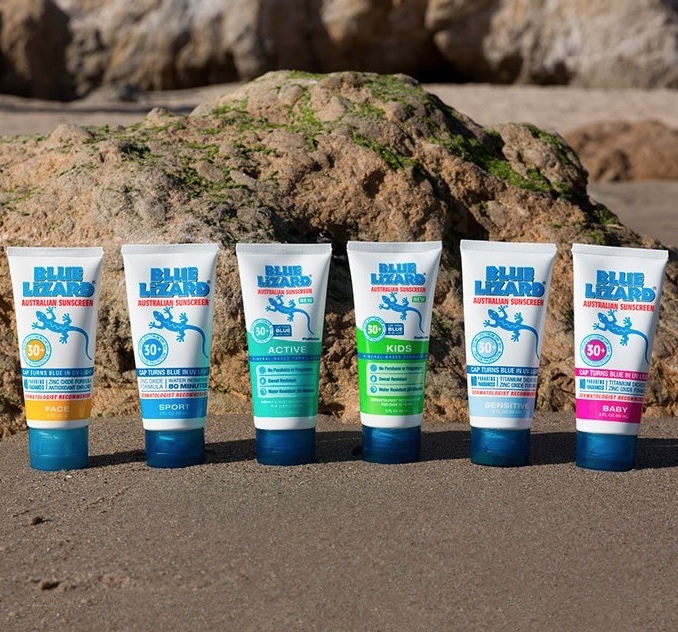 Blue Lizard sunscreens - Chemical and fragrance free? It must be noted that although they claim to be "chemical free" on some of their sunscreens, this only refers to the active ingredients being chemical free. Ie. Where they only use mineral sunscreens instead of chemical sunscreens and no combination of the 2 types. This does not mean that potentially toxic, synthetic chemicals are avoided in the non-active ingredients. They also claim to be "fragrance free", which refers to their having no added fragrance. This means that the fragrance, or smell, of the sunscreen will therefore be a natural reflection of the sunscreen's ingredients.